IHS iSuppli has once again taken apart the newest set of iPhones in an attempt to come as close as possible to estimating the actual component cost of the new devices. 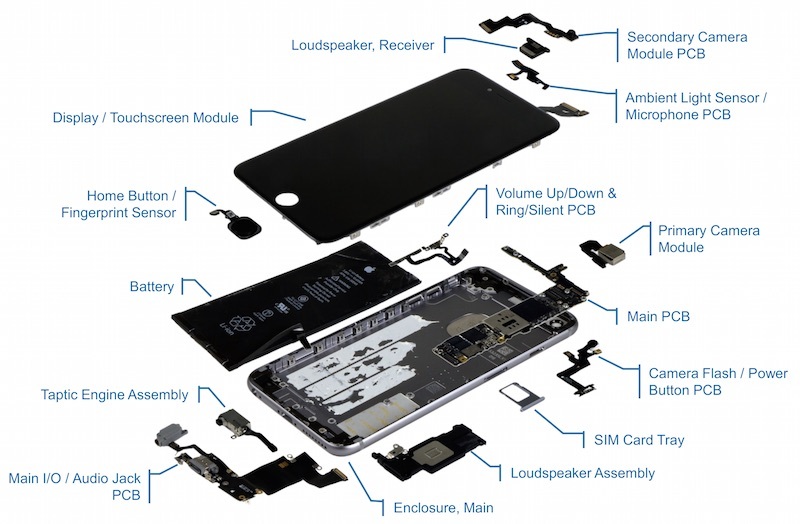 According to IHS iSuppli's teardown of the iPhone 6s Plus, the bill of materials for a 16 GB version comes to $231.50, with manufacturing costs and other minor items raising the overall price slightly to $236. One of the biggest areas of increased cost is related to 3D Touch, which adds about $10 to the overall component cost of the iPhone 6s Plus when combined with Apple's Taptic Engine used to fuel the new feature. It's these improvements that have boosted the new iPhone 6s Plus to cost around $16 more to manufacture than last year's iPhone 6 Plus, according to IHS Technology senior director of cost benchmarking services, Andrew Rassweiler. Overall, the most expensive aspect of the new iPhone 6s Plus is its display, with the addition of 3D Touch slightly increasing the component cost to $52.50 this year. Other high-cost components include the iPhone's new 12-megapixel rear camera and 5-megapixel front-facing camera that together are estimated to cost $22.50, and the A9 chip at $22.00. IHS also points out the incremental cost differences between each step-up in memory capacity, which sees a small component cost difference when in comparison to Apple's $100 jump between capacities like 16 GB and 64 GB, for example. Overall, IHS iSuppli's teardown concluded that the iPhone 6s and iPhone 6s Plus see most of their value additions in the form of overall durability for the new devices. This is thanks to new components like the 7000 Series aluminum case, an upgraded Gorilla Glass 4 cover, as well as "additional gaskets and seals" that IHS says improves the water resistance of the new iPhones, which has been studied in the days since release. Earlier in the year, Apple CEO Tim Cook went on the record during one of the company's annual earnings calls, denouncing component cost teardowns like IHS iSuppli's of the iPhone 6s Plus. "I've never seen one that is anywhere close to being accurate," Cook said. Such estimates do not take into account an array of costs, including research and development, software, and licensing costs, making profit margins appear much larger than they actually are. And given the proprietary nature of many of the components, cost estimates can be rough. The estimates can, however, be somewhat useful in comparing differences between generations to get a general idea of the potential cost impact of hardware changes. 32GB should be at the base. Apple makes billions every quarter. They keep getting richer and richer. I'm a huge Apple fan and a huge customer of Apple, not only personally, but corporately too. I'm glad they are rewarded for their quality and ingenuity. However, this was pure greed and you would think they could give their customers a break. Especially lower and middle class America. I hope this hurts them. As a dedicated customer for over 10 years having spent 100s of thousands of dollars they are pushing my limits. I have other options as much as I hate to go there. They probably sat around the table telling themselves, if we keep the 16GB we will take the extra profit and give ourselves huge bonuses this year. Agreed, the base should be at 32GB. This was a stupid executive/accounting move. Shame on you Apple and shame on you Tim Cook. Would it be too much to help your customers out a bit? They got in on all those going out of business sales. Speaking as an accountant, these non-cash flow expenses can be significant and are often ignored since R&D is expensed and not capitalized as part of WIP or FG inventory. While surely Apple is making incredible (almost excessive) margins, it's not as simple as "$800-236 = 564 of rip off!!!" As long as people think that R&D, facility maintenance, labor, shipping, and other costs are free, those comments will be necessary. And yes, that doesn't include that evil "profit" thing that companies account for. Steve said ''we don't ship junk''. Well, Tim clearly doesn't believe this since he's still selling the 16gb iPhone. Maybe at that time, 16 was enough. Hell, maybe it was even a lot, like what 64gb is now. But times change, apps' size gets bigger and bigger and so do the photos and not to mention the video size when filming in 4K. Clearly Tim wants to ship junk, because that's what a brand new iPhone with 16GB of storage is. These costs doesn't include the price and effort put in to developing the actual components. Without that work, there wouldn't be any components in the first place.